Lettuce and tomato add nutrition to a pulled pork sandwich. 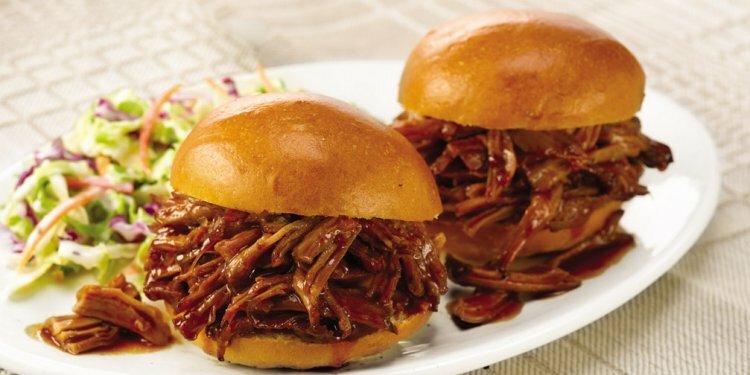 Pulled pork is made with a pork roast that is slow-cooked and smoked to create fall-off-the-bone tender meat. The meat is paired with barbecue sauce and served on a bun. Corn on the cob dripping with butter and salty french fries are among the most common accompaniments to a pulled pork meal, but they are far from being the healthiest. Focus on fresh ingredients to prepare nutritious side dishes that complement the smoky flavor of the pulled pork. Fruits and vegetables are loaded with essential vitamins and minerals that support your health. Serve your pulled pork with a side of fresh pineapple for a Hawaiian-inspired side dish. A bowl of fresh berries complements the smoky flavor of the meat by infusing your meal with a hint of sweetness. An ear of corn on the cob with a small smear of butter provides a healthy dose of fiber. Sprinkle fresh herbs on the corn to add flavor to this barbecue staple. Steamed green beans, grilled asparagus or baked squash are additional side dishes loaded with flavor and nutrition. A tossed green salad made with fresh lettuce, tomatoes, red onions, cucumber and a splash of balsamic vinaigrette is a low-calorie side dish that supplies vitamin A, vitamin C and iron. It's far from your only salad option. Coleslaw is a common barbecue side dish. Make a healthy homemade version that is lower in fat, sugar and salt than restaurant versions. Combine shredded cabbage, carrots and low-fat mayonnaise for a side dish that adds vitamin A, fiber and potassium to your meal. Combine low-sodium canned kidney beans with chopped celery, minced onions and a drizzle of olive oil for a healthy bean salad that's loaded with protein and fiber. Add fresh vegetables to cooked pasta and top it with shredded mozzarella cheese for a calcium-rich pasta salad that also supplies plenty of fiber. Make a healthy potato salad by combining cooked potatoes with steamed green beans, fresh parsley and a squirt of spicy mustard. Toss cooked, cubed sweet potatoes with a small amount of melted butter and ground cinnamon for a side dish that contains a healthy dose of vitamin A. Cut russet potatoes into thin slices, drizzle with olive oil and sprinkle with fresh herbs. Roast until slightly crunchy and serve as a lower-fat option to potato chips.